Cisco Unified Data Center is the optimum platform for Cisco Hosted Collaboration solutions and the foundation of pretested and pre-configured solution stacks such as Flex Pod and Vblock Infrastructure Platforms. Open standards and APIs allow for integration and management of hardware and software solutions from Cisco ecosystem partners, providing flexibility to data center architecture. The Unified Data Center also offers a flexible and open data center architecture that will support legacy infrastructure components, as well as delivery of IT-as-a-Service and cloud services. Respond more quickly to changing business demands with Unified Computing. Learn how Cisco Unified Data Center can promote innovation in your organization. Increase efficiency and scale with Unified Fabric. Simplify deployment of IT infrastructure and services with Unified Management. 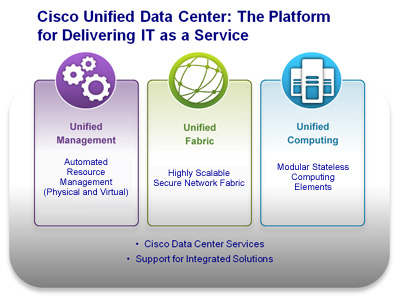 Learn how Unified Data Center delivers a fabric within and between data centers.